In comparison with other icy locations for crime fiction , such as Scandinavia or the Arctic, comparatively few have been set in Antarctica. Matthew Reilly’s Ice Station (1998) and James Rollins’ Subterranean (2009) spring to mind. 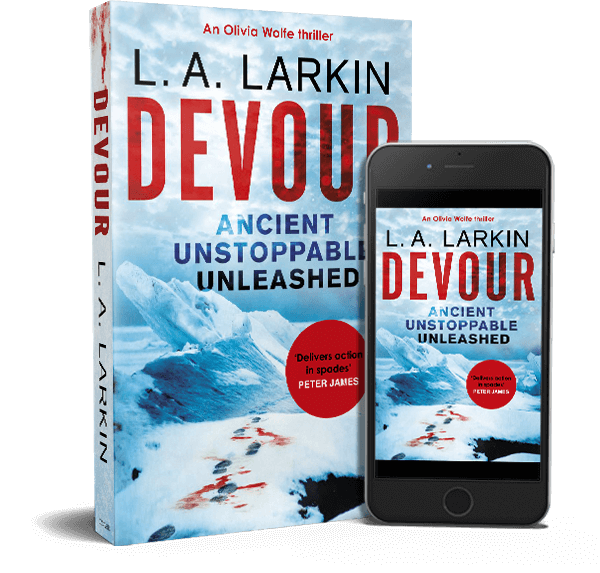 I am one of the very few crime fiction authors who has set two thrillers there: firstly, Thirst, and now my new book, Devour, published by Constable/Little,Brown. I can only put this down to the degree of difficulty in getting to Antarctica, and, perhaps, because it is such a truly alien place, hard to bring to life on the page in a credible way unless you have actually experienced it? A fellow Sister In Crime author, Ann Turner, has set her latest mystery in Antarctica, Out Of The Ice, and we recently were on a panel with Hazel Edwards discussing this very topic. In fact, on 7 October this year, Hazel Edwards, who has set some of her two hundred books in Antarctica, officially launched ‘Antarctic Noir’. Here’s a link to her article. Antarctica is the perfect location for a thriller because it offers isolation, jeopardy, and no readily available police force or backup when a killer is on the loose. It also enables me to put characters under pressure, because Antarctica is fraught with hazard, and even before I introduce sabotage and murder to the mix! So what is ‘Antarctic Noir’? In my opinion it’s crime fiction set in Antarctica, in which the threat originates from there or the mystery will lead them there. The central character is usually somebody who has enough skill to survive the extreme environment. They will face a threat from a human or non-human killer. It’s interesting to point out that in Ice Station and Subterranean the heroes were male with military/law enforcement backgrounds. I am fascinated by what ordinary people can do in extreme circumstances – people who are clever, skilled but vulnerable. So in Thirst, the hero is a glaciologist (he’s also pretty good at swinging an ice-axe!) 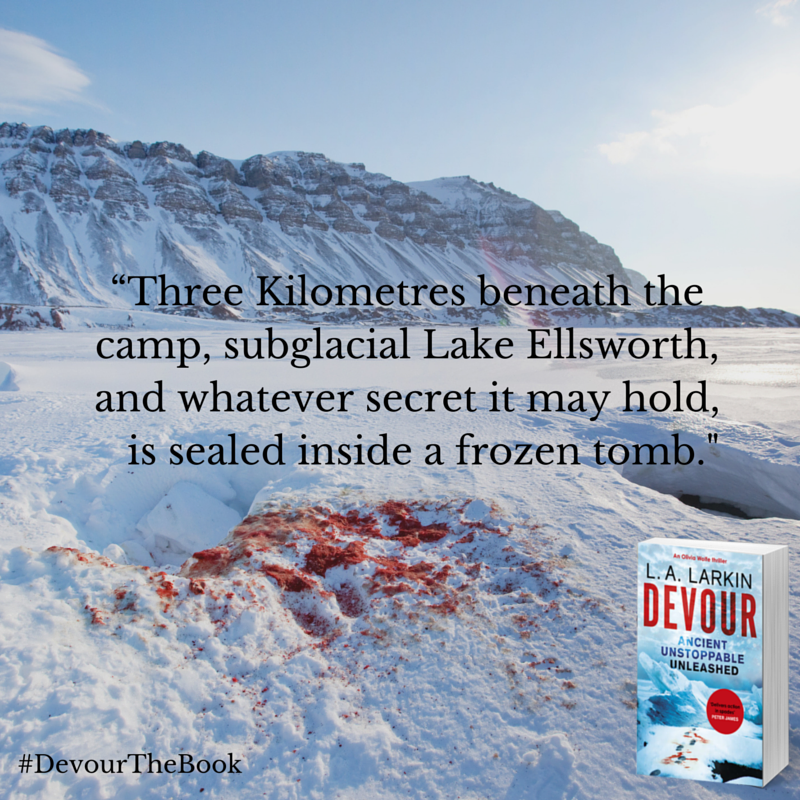 and in Devour, an investigative journalist, Olivia Wolfe, who is well-trained in self-defence but out of her comfort zone in Antarctica. I should point out that there has never been a murder in Antarctica, and long may it stay that way. But it doesn’t mean we can’t imagine murder and mayhem in fiction! The stories in both Thirst and Devour have been inspired by real events in Antarctica, in particular scientific expeditions. Click this link to a video where I explain, ‘Why Antarctica?’ Enjoy!